Edited, corrected & expanded from Catherine M. Wood's original work, which is in the public domain, and was published in San Diego by Frye & Smith in 1937. Edited, corrected & expanded from Marion F. Beckler's original work, with permission of Stanworth Beckler, which was published in Palm Desert, California by Desert Magazine in 1958. Edited & expanded from undated Robert Asher manuscript. This book has considerable information about Native Americans on Palomar. 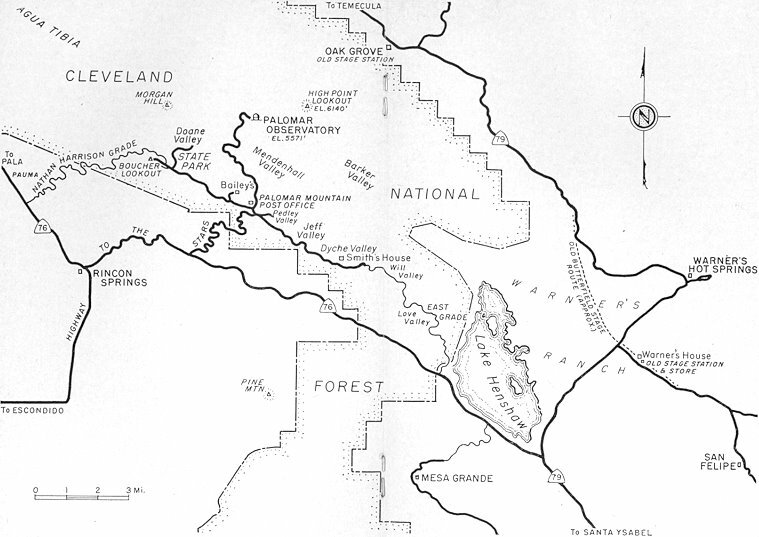 Each band of the Luiseno Indians between Pala and San Jose Valley (Warner's Ranch) had a tract on Palomar Mountain, to which it moved during the acorn gathering season. Not a history; this is a long poem set at Palomar Mountain. Jeff Smith, San Diego Reader, May 26 and June 2, 2010. Two articles on Nate Harrison, Joseph Beresford, and the Frazier Sisters. 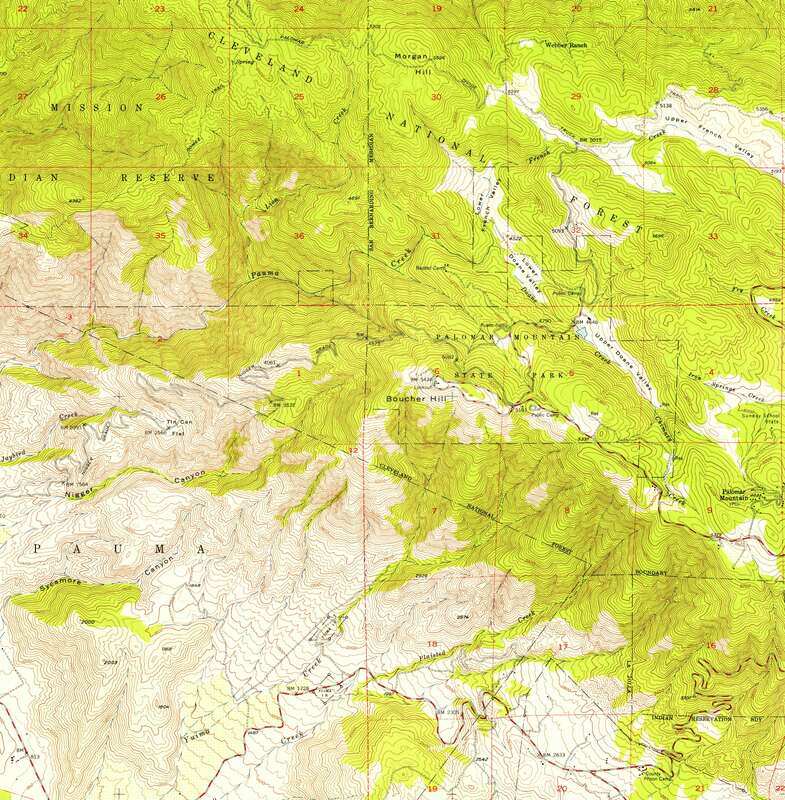 Robert Asher's paintings included Palomar Mountain locations. Edited by Peter Brueggeman from "Memoirs of Ed Fletcher" by Colonel Ed Fletcher. San Diego: Pioneer Printers, 1952. What Do You Do on Top of Mount Palomar? 1914 Cecil B. DeMille film had several scenes shot on Palomar Mountain, including this scene at George Doane's abandoned cabin in Doane Valley, in what is now the State Park. 1977 "Crater Lake Monster" film was shot at several Palomar Mountain locations and at San Vicente Reservoir. George Dyche's ranch at far left in middle, with East Grade road below it. Doane Valley at lower left. Southern edge of Palomar Mountain range in middle. Pauma Creek flowing out of Palomar Mountain range at upper right. Oak Grove in middle left. Pauma Creek flowing out of Palomar Mountain range at lower right. Native American placenames from Sparkman, Culture of the Luiseno Indians: Awa' / Aguanga; Malamai / Agua Tibia; Yami / Site of Potrero ranch house (Cuca Ranch) / Ta'i / Peak of Palomar, near Bougher's; Wikyo / Highest Peak of Palomar Mountain; Takwish poshapila / Rocky Peak East of Wikyo; Paauw / Palomar Mountain; Kuka / Old Potrero village; Ahuya / Old village site above Rincon on road to Potrero; Pashkwo / Monkey Hill, San Jose valley; Paisvi / Iron Spring on Palomar; Wavam / Pauma Indian encampment during acorn-gathering season on Palomar; Shoau / Pala Indian encampment during acorn-gathering season on Palomar; Shautushma / Yapicha Indian encampment during acorn-gathering season on Palomar; Pavla / Indians of Kuka or Potrero encamped while gathering acorns on Palomar; Old village sites on Palomar / Malava, Wiya', Chakuli, Ashachakwo, Pahamuk, Tokamai, Mokwonmai; Springs on east side of Palomar / Pakuka, Atupa. 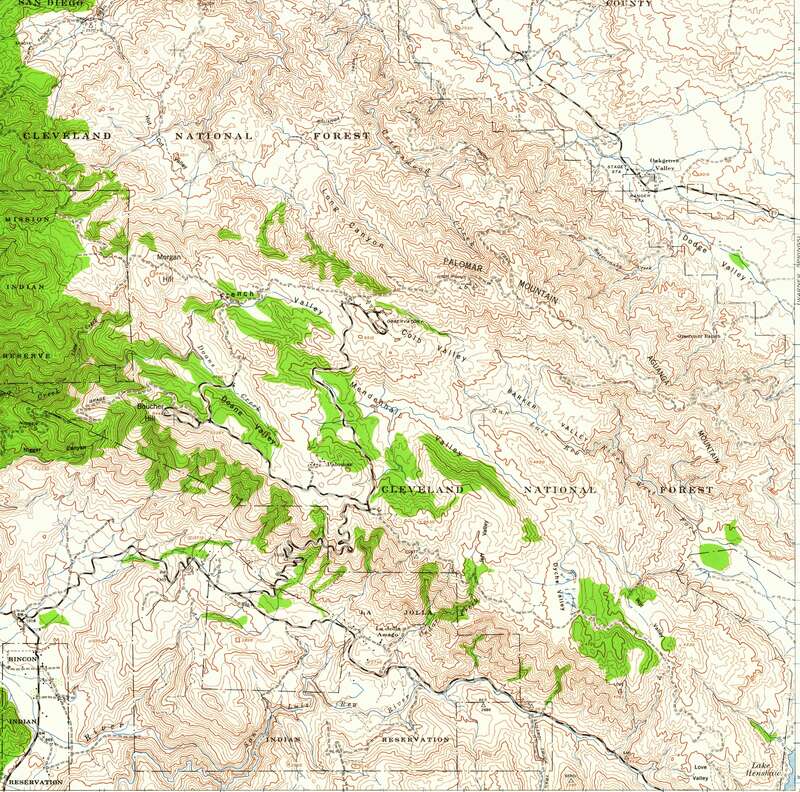 maps northeastern section of Palomar Mountain range including High Point. Aerial photography 1939. U.S. Geological Survey. Copied in 1947 from 1:62,500 Palomar Mtn 1942. Marion Beckler "Palomar Mountain Past and Present"
LAND PATENTS are deeds from the U.S.government conveying title, and recorded by the government. The U.S. Public Land Survey System divides land into 24-mile tracts that are subdivided into 16 townships that are 6 miles by 6 miles, or 36 square miles. Each township is divided into 36 one-square-mile sections. Each section is 640 acres, and then sections would be halved and quartered, etc. For example, a Robert Asher land patent dated January 16, 1911, specified Township 9 South, Range 1 East, Section 31. Some patentees bought their land for cash, others homesteaded a claim, and others came into ownership via a donation act passed by Congress. Land Records chapter from "The Source: A Guidebook to American Genealogy"